There's a new offer on the table for a Burger King "peace burger." McDonald's shunned Burger King's offer to make a McWhopper for Peace Day on September 21, but Denny's stepped up on Monday with full-page ads in USA Today and the New York Times offering to collaborate. 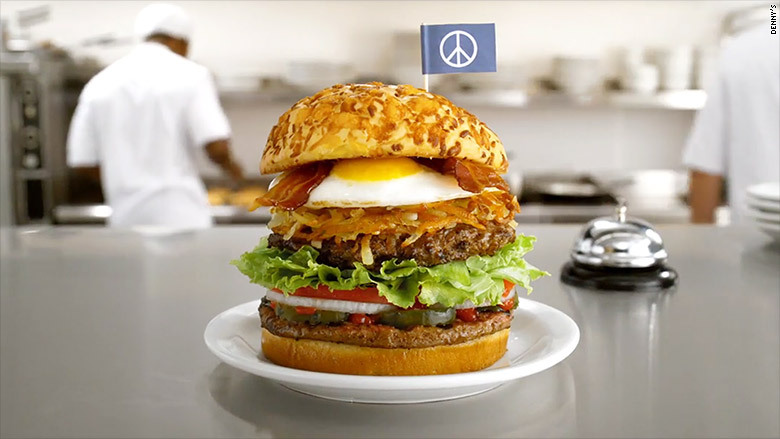 "Hey @BurgerKing, we love the idea of a peace burger," the ad reads. "Let's take our signature Slamburger with your McWhopper and bring them together for a good cause." The proposed hybrid hamburger stacks two beef patties with pickles, onion, lettuce, tomato, hash browns, fried egg and bacon. Denny's first suggested the interbred burger in social media posts last week. Peace burger negotiations have not involved subtle diplomacy. Burger King first offered to work with McDonald's (MCD) in an "open letter" ad in the New York Times. McDonald's CEO Steve Easterbrook replied to Burger King on Facebook (FB). He said he "loved the intention," but asked to collaborate on a "meaningful global effort" instead. Easterbrook's post closed with, "P.S. A simple phone call will do next time." Burger King hasn't yet responded to Denny's offer. While Burger King's proposal to McDonald's suggested selling the burger on the U.N.-designated International Day of Peace at a pop-up location in Atlanta, Denny's hasn't made specific plans for the collaboration.